"A retired man resists the overprotection of his daughter Nina to keep his independence." 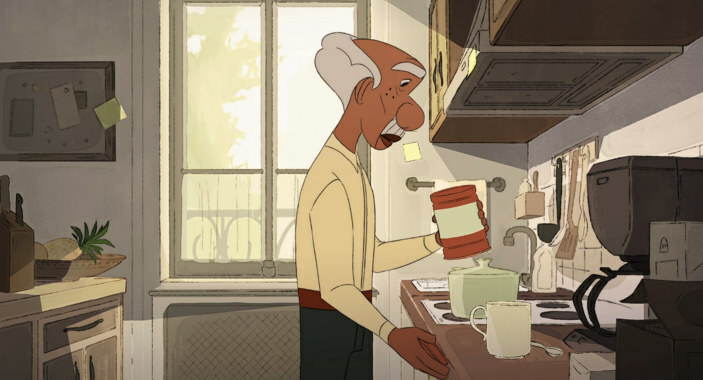 A strong internal conflict is transposed into staging in this remarkable short created by 5 artists at Parisian school Gobelins, which describes the relationship of an ageing father and his daughter. The story is narrated from the POV of the father using a high level of subjectivity. Located in an urban area, elements from staging are employed together with sound to create a threatening atmosphere and build a conflict with the environment, which reflects the main character’s internal struggle. Aesthetics and environment design play a key role: the different locations are portrayed with detail, which is later erased by the bleaching effect, which clearly has been polished with plenty of fine tuning. Visual rhythm is handled mostly through editing. A few camera moves are used: pans help describe the main character’s life, with a couple employed for expressive effect to build tension; a few zooms are also present, one towards the end effectively transmits the father’s growing feeling of isolation. Visual rhythm increases as the father’s memory problem accelerates, together with the bleaching effect’s pace. Long shots abound, to describe the environment at first and then to turn it into a source of conflict. A few close-ups (and an extreme close-up) are used for expressive effect. What makes the film work so well? The subjectivity in narration helps transmit the character’s conflict very convincingly, including the feeling of loss of control and helplessness. The subjects of personal dignity, ageing and need for independence will resonate with a wide audience, and the daughter’s presence helps create the bittersweet flavor of the story.